Immerse yourself in worlds of magic… with all the comforts of home! 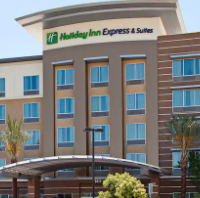 Welcome to the Holiday Inn Express & Suites Anaheim, a contemporary hotel offering family-friendly accommodations and amenities in a resort-style setting. Located steps from Disneyland Resort theme parks, this modern oasis boasts spacious rooms and suites, a 24-hour fitness center and sparkling outdoor pool. Start your day with a complimentary hot breakfast before heading to the parks, or discover an amazing array of fine dining, shopping and entertainmentoptions at the Downtown Disney District. With so much to see and do, it’s the perfect choice for family vacations or weekend getaways!